At Osborne Painting, we understand the importance of a well-maintained and presentable deck. As industry experts, we’ve been serving Raleigh and surrounding areas for over 20 years. Our well-versed and dedicated professionals can efficiently and effectively pressure wash, clean, paint, stain, and seal your deck back how it is supposed to look, resulting in an increased home value for years to come. How can I tell if my deck needs to be refinished or replaced? In order to determine whether your Raleigh deck needs to be refinished or replaced, we recommend contacting Osborne Painting to schedule a complimentary examination. More often than not, we find that wood repair services are warranted along with deck refinishing and staining services. Rather than quick fixes, we place extensive emphasis on executing our projects with the bigger picture in mind as opposed to the short-term picture. When should I stain my Raleigh deck? Though the Southeast states tend to receive warm and sunny weather, mother nature still has a way of putting your beloved North Carolina home through harsh weather conditions from time-to-time. 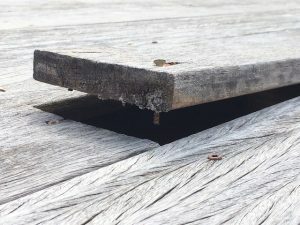 Excessive rain, sun, and even wind have the potential to leave your deck appearing worn-out a and not-so-up-to-date. By maintaining a well-stained deck, you increase the likelihood of maintaining its structural integrity and durability while also increasing the overall value of your home. As far as seasons are concerned, it depends on where you’re located geographically. If you’re located in an area that receives extensive amounts of snow or constant rainfall, for example, then your project windows will differ from North Carolina’s. 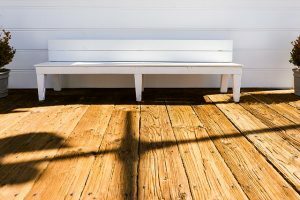 When it comes to North Carolina, the main weather-related factor when it comes staining to deck refinishing, cleaning, and staining is excessive and potentially detrimental sunlight. By properly preparing for your Raleigh deck to be stained, you can avoid inconvenient and unnecessary setbacks such as having to re-stain portions of the deck and having to fix landscaping damage because of poor protection. What is the best stain to use for a deck? Can I stain or refinish my deck if it’s going to rain? It is recommended that you wait 24 hours before applying any stain to your deck. At the same token, it is recommended that rain does not touch your deck for 24 hours after it is stained or refinished. By waiting the appropriate amounts of time, you’re decreasing the chances of having to go back over your deck with additional and warranted coasts of stain. It is common for rain to wash newly-applied stain away. How much stain do I need for my deck? On average, decks are between 200 to 300 square feet. That said, 3-4 gallons of stain should be enough for the entire project, give-or-take. If you have a particular product you’d like us to use for your Raleigh deck refinishing project, feel free to let us know. We would love to provide input to ensure your deck turns out exactly how you wanted it to. How many coats of stain do you put on my deck? Typically, 2 coats will square your project away start-to-finish. If your Raleigh deck has dense hardwoods, let us determine the perfect amount of stain to apply in order to avoid potential roadblocks in the future. My deck is constantly exposed to sunlight. Is there a way to minimize color fading? North Carolina is an outstanding state to live in but there are weather-related things to keep in mind when it comes to deck staining and refinishing. To avoid stain fading, we recommend using specific stain products as well as following specific and proven steps to ensure you receive a lasting and presentable finished product. If you have any questions about avoiding stain color fading for your deck or other areas of your home, be sure to contact the experts today. Will my entire deck need to be sanded down before new stain is applied? No, all-encompassing deck refinishing is not always necessary. As long as your deck’s wood is in strong and sturdy shape and without any large cracks or holes, there is a good chance it will only need to be restained and resealed. Why is my deck gray in color? A deck that is gray in color has likely suffered from extensive Ultraviolent light. You may experience this inconvenience if your deck becomes damaged by UV rays over a significant period of time. In conclusion, there are many ways to determine if the deck on your Raleigh home needs refinished and livened up. Osborne Painting will restore and revitalize your deck with our quality and guaranteed deck refinishing services. An unappealing deck doesn’t necessarily have to be rebuilt. Rather, contact the Raleigh deck refinishing experts to restore your deck as good as new. Along with deck refinishing and repair, we also offer wood rot replacement, door and window replacement, and siding replacement. Osborne painting has experts in all of these fields, and we would love to simplify your life. When you choose Osborne Painting for as your painting contractor in Raleigh, Cary, Durham, or Chapel Hill, for any of your interior or exterior painting, refinishing or restoration needs, we guarantee you’ll receive the best service possible — we like to refer to it as “The Osborne Painting Difference”. Please contact us today for your free estimate by giving us a call at (919)878-6611 or fill out our easy-to-use contact form.